Rule 701 governs how a lot of Startupr issue their employees equity. So, if you are about to provide your employees with stock options the company, then you need to know all about Rule 701. This rule covers the equity offered by a company. It allows an exemption to reporting for smaller startup companies. Hence, it is better to know all about Rule 701 and why you need to comply with it. To begin with, Rule 701 is a federal securities exemption that has been created for the compensatory equity issuances. Basically, it is a part of the securities law so that people can both take advantages of owning shares and also pay the applicable tax to avoid any problems with the government. This article would make things a lot clearer for you. Rule 701 is a part of the securities law. It is the federal exemption from registration for equity compensation according to the written compensation agreements or written compensatory benefits plans. In short, the Rule 701 is a broad exemption. No forms nor fees are needed to be sent to the SEC. However, Rule 701 have some certain important limitations and conditions. In case you run afoul of these, there could be onerous and consequential repercussions, which also includes personal liability for the directors and officers of a company. Another thing that you need to know about Rule 701 is that it has strict mathematical limits, which cannot be exceeded. There are certain disclosure requirements that are activated as soon as the value of the equity compensation that you (a founder) grant exceeds $5 million ($10 million onwards from July 2018) under Rule 701 during any consecutive period of 12 months. Not sure what the mathematical limits are and still need a clearer understanding about it? Well, the next part should help you in this case. $1,000,000 (which is calculated by number of shares granted with the exercise price of the shares). But why is this important to you? Well before you are granted a set of options, you would have to ensure that you are operating based on the limitations. Additionally, in case you grant equity awards with values of more than $5 million ($10 million onwards from July 2018) within a 12-month period, you would have certain disclosure obligations as mentioned below. As per Rule 701, issuers are required to offer the recipients of the stock incentive a copy of the agreement and plan under the granted compensation. Additionally, in case the amount or sales price of the shares that are sold in any consecutive period of 12 months exceeds $5 million ($10 million onwards from July 2018), there are some additional disclosures that have to be followed. They should be natural persons. Why is Rule 701 important? It is vital to comply with Rule 701 so that you can avoid any trouble that would come up with the SEC(Securities and Exchange Commission). Moreover, those who are granted the shares from a company are obligated to register the shares with the SEC. These people (employees) who have the shares can utilize an applicable exemption. However, the transactions do not get exempt from anti-fraud, civil liability, and any other relevant federal securities law. It is vital to note that when you are starting a business and trying to attract new talent in the market, Rule 701 is also applies to you. With stock options, you as a company work towards making your business more attractive to potential employees. But if you do not share the requirements with your employees, it would become a burden when they do not register the stock and pay the fee. In short, Rule 701 is important for the company. This is because in case a company expects the entire sale price of the shares granted within 12 months time would exceed $5 million ($10 million onwards from July 2018), then as per Rule 701, the company has to offer some specific details to the purchasers (those who are holding the stock and about to exercise them). GAAP compliant financial statements, which includes any statement of income, capitalization, and cash flows of the preceding 2 years, and all the latest balance sheet items. All these details are highly vital for the shareholders, so that they can make a proper decision before they exercise their option. Does Rule 701 apply to me? An aggregate that offers equivalent to or even less than $5M ($10 million onwards from July 2018) only demands the company in question to share a copy with all the details of the equity compensation plan or the compensation contract with the recipients of the shares. In case any of the above situations take place within 12 months, a prospectus delivery requirement is triggered. What is prospectus delivery requirement? As per the Securities Act of 1933, any business that directs an IPO (initial public offering) which includes a transaction that is going public, has to disclose material information to the investors. The information that has to be provided includes the details of the financial condition and business of the company along with the securities that the company is proposing to offer. Moreover, when the company’s transactions are going public, the disclosures are mostly offered in the Form S-1 Registration Statement. As soon as the S-1 registration statement becomes successful, the company offers all the potential investors with a prospectus that is a part of the registration statement. There are two parts that are there in the prospectus as shared below. In this part, the company has to share the specific disclosures which includes the information on the management, financial condition, operations and business of the issuer. This part contains the details that are not necessary to give to the investors. Additionally, the financial statements that are there in the prospectus has to be audited by a member of the PCAOB (Public Company Accounting Oversight Board). The rules of the SEC permits the smaller reporting companies to offer much less information on the financial situation as compared to the larger reporting companies. Before the registration is declared as effective, the company can share the prospectus with potential investors. This prospectus would contain significantly all the details that would be in the final prospectus, except the pricing details. Basically, this prospectus would display the price rangeand not the final offering price at which the shares would be offered. In the initial public offering, a final prospectus should be given to investors before or while they buy the offered shares. Moreover, the obligations of the final prospectus delivery is met when the company files the final prospectus that satisfies all the requirements of the section 10(a) of the Securities Act based on the Edgar System of SEC. What are the things that do not apply to the Rule 701? Rule 701 does not apply to any sales event where the sale doesn’t reach $5 million ($10 million onwards from July 2018) or 15% of the issued securities in the same class or the balance sheet assets in 12 consecutive months. One of the most common mistakes that people make is granting equity compensation to those who are ineligible as per Rule 701. In short, the advisors and consultants that maintain the company’s market for the securities aren’t permitted to get any shares as compensation from the company. There are many startup companies that grow faster than others and forget to realize when their threshold has reached due to which they would need the Rule 701 disclosure requirement. This means that as soon as a company reaches the threshold, they would need to make the required disclosure go forward. Keep track of the aggregate year-to-date “sales” of any equity compensation, mostly at the time when the shares are about to be granted – The orderly calculation and confirmation become very important as and when the valuation and hiring increases, making the company grow. In short, the $5 million($10 million onwards from July 2018) threshold would be crossed faster than imagined at a much higher valuation. It is advised to take the help of a lawyer for offering the shares to the purchaser. They would help in guiding you the right way and also monitor all the compliance needs – In case you have never thought about the Rule 701 till now or feel that you have almost reached the $5 million($10 million onwards from July 2018) threshold, you need to contact a lawyer to understand your case and find the smoothest solution possible. Examine if you can grant shares to some people without being under Rule 701. The people we are talking about here are the accredited investors, directors, officers, etc. – Maintain all the records possible to substantiate exemption. Make sure that the GAAP financials are available as soon as the $5 million ($10 million onwards from July 2018) threshold has been crossed. In case the company offers Restricted Stock Awards or RSUs, then Rule 701 Disclosure Package should be provided to the purchaser before granting them. Moreover, the company can delay granting the shares to some new hires until they have covered a specific period of time working for the company. The recipients of the shares can be asked to sign a confidentiality agreement before they are allowed to see the financial information of the company. – Analyse to see if the proprietary information agreement with employees is sufficient. Since Rule 701 is an exemption to filing, it is not required to file paperwork to the SEC. But it is still important to get a written agreement that would show that a person has received the stock from the company as an award or incentive. When the owner of the shares wants to sell, it would have to be registered with the SEC based on the standard registration rules. Rule 701 exemption is only used for the initial issuer and cannot be used for a resale. The company has to be private and should be subjected to reporting requirements of Section 15(d) or 13 of the Exchange Act. The company that files the reports of the Exchange Act is eligible for using Rule 701. Those who are eligible should be a part of the company and includes the officers, consultants, advisors, the issuer is a business trust, trustee, general partners, and directors. However, it is advised that the companies should consult with a lawyer so that they can avoid granting Rule 701 equity to the ineligible people. The granted shares under Rule 701 are restricted and can’t be sold again unless they are resold pursuant to another exemption or registered with the SEC. Sales and offers that come under Rule 701 have to comply with any state “blue sky” laws as well. Rule 701 is not applied to the transactions that are entered into for the purpose of raising capital. There are special rules for equity that is sold and offered to the advisors or consultants. Rule 701 is only applicable for them in case they are natural people and offer actual services to the company. They should not be connected to providing any securities to raise capital, nor should they be working towards maintaining or promoting a market for the securities of the issuer. Now that you know more about Rule 701, you can avoid any trouble with the SEC by following the limits and restrictions of the rule. In case your company’s threshold reaches $5 million ($10 million onwards from July 2018), remember to file for required documents. Moreover, it is important to keep a proper track of all the shares that you are giving out of the company. For that, you should use a cap table software application like Eqvista. 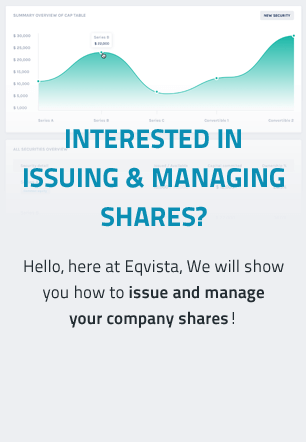 If you are looking for a reliable software that would help you keep track of all the shares and manage them well, check out the Eqvista software. Moreover, if you need help with more information about Rule 701, you can contact us at Eqvista today!